A friend of mine let me know about this - this is 'next generation' LEGO. 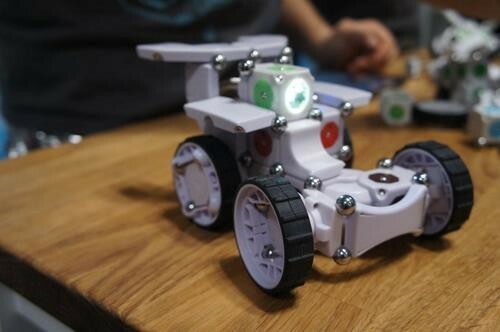 Modular Robotics, a Colorada (USA) based team who brought the world cubelets have taken it to the next level with MOSS where it is now possible to build complex robots without the need to know how to code or deal with wires - which makes them perfect for kids and adults who still have a prominent inner child desperate to escape. Starting out as a kickstarter project which almost quadrupled their goal and as one would expect with their in-house manufacturing process that stock is hard to come by - but the idea is great and they have implemented perfectly and the results look amazing. Each block has a color face which serves set purposes, either to send power, send or receive data or pass through (power and data) - earthing is done via the metal balls that allow distinct joints such as universal, hinge or secure components together magnetically. After digging around their website, finding the MOSS SDK it is possible to even program the little cubes, although it isn't required (an application exists for control already). The code base looks very arduino'ish with C based setup() and loop() routines the developer needs to implement but it has a very limited set of API's around turning on/off LED and eight GPIO's. The "brain cube" has eight programmable faces which essentially reflect eight GPIO's - connecting them to a motor or data sensor would require a network of pass through connections from the brain the to end unit however (that's the fun of building the robot). Their website is offering two different kits for purchase - getting started (Zombonitron 1600 at $149.95 USD) and the full set (Exofabulatronix 5200 at $479.95 USD), the latter which is coming during the summer and will allow the happy owner to create thousands of robotic combinations. ... shut up and take my money!